All that is wonderful about fall. The colors, the warmth and the traditions are beautifully celebrated in a bright and whimsical bouquet classic, newly refreshed for 2015. 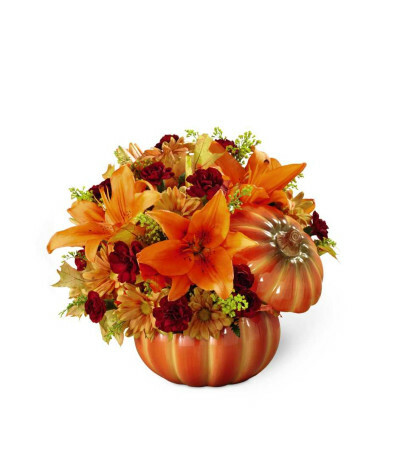 This evocative tribute to the season includes orange Asiatic lilies, butterscotch daisy pompons, burgundy mini carnations, goldenrod and autumn oak leaves beautifully arranged in a keepsake ceramic pumpkin that comes complete with a lid. 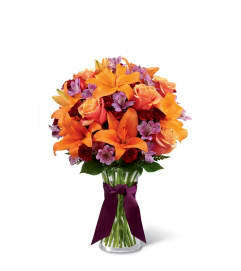 The Premium Style option includes the harmonious addition of red roses. From Labor Day through Thanksgiving, this fall favorite will deliver an extra shot of seasonal joy to birthday and anniversary celebrations, "get well" wishes and make a fun centerpiece for autumn entertaining.